Ever heard someone say, “Yep, the drivers where I live are just fine. Everybody is safe and courteous. No complaints here!” Of course you haven’t, because everyone has to deal with horrible drivers, no matter where they live. But some places are better than others. 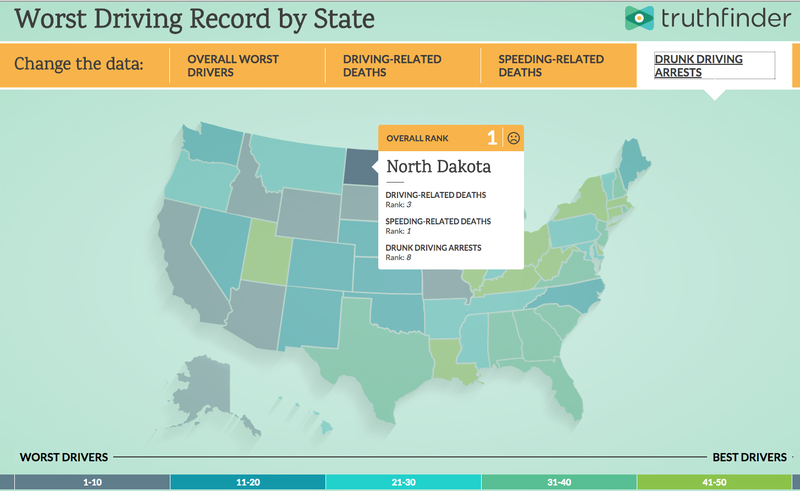 The website Truthfinder has compiled an interactive guide to the worst drivers in America based on drunk-driving arrests, speed related deaths and other driving-related deaths. They based their findings on data from the IIHS, NHTSA and the U.S. Justice Department. Overall the worst states are North Dakota, Wyoming and Montana, possibly because there’s nothing to do up there except drink. America’s most American state Florida fared better than you’d expect, coming in at 38th worst state out of 50 overall and relatively low (44) in terms of speed deaths. I can’t say the same for my home state of Texas, which ranked 19th overall and was 17th for non-drinking and non-speed-related driving deaths.